The Standard SPF-P9 Booklet Maker can staple and fold up to an 80 page booklet at speeds up to 2,100 sets per hour. Automatically with a QC collating system or semi-automatically by feeding the document sets manually. This machine is well suited to run both off-line and in-line with the QC-S30/300 collators. Changing over to any size paper from 8.5″ x 11″ to 11″ x 17 is accomplished by rotating the easily accessible control knobs. When working with 8.5″ x 11″ sized sheets, finished sets can be stapled and folded, folded only, top or side stapled, or top stapled and folded. The Standard SPF-P9 can staple and fold booklets up to 22 sheets at a time. The FC-P9 Face Trimmer can be added to trim the edge of the book by .08″ to 1/2″ to provide neat, high quality booklets. Staples are formed to a flat shape and a strong rigid folding unit provides smooth flat folds for neat stacking. The Standard SPF-P9 can produce 33 booklets per minute which is ideal to produce manuals and documents with speeds that support a wide volume range. The mirror monitor informs the user when there is a paper jam or when it is time to change the staples. The optional ED-9 Delivery Belt Conveyor can be added to the system to provide a greater stacking capacity to increase productivity. If you have any questions or are interested in the Standard SPF-P9 Booklet Maker, visit us at SpiralBinding.com. 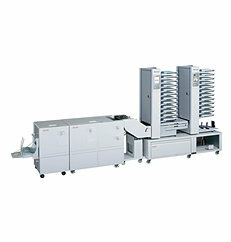 We have great pricing on a full line of Booklet Maker Systems. Call us at 1-800-631-3572 for more information!